(Initial reaction because I love Wolf. And that ending. And because, like I said on Goodreads when I finished the book: "I ship myself with Wolf." I liked Cinder, the first book in the Lunar Chronicles and Scarlet's predecessor. While I didn't love it, I was still eager to read Scarlet, and I'd heard that Scarlet was better than Cinder, which was promising. So I read Scarlet. And, well...I think I liked Cinder more. 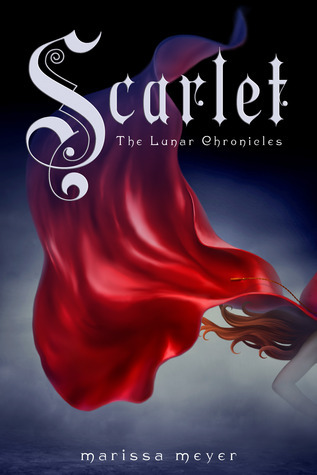 One thing I like about Scarlet--and the Lunar Chronicles--is how the tales are retold. Key elements are taken from the original story and twisted into something more modern and futuristic and set with different characters throughout the world. While it's not some cutesy series that's all kittens and flowers, it does have a sense of fun and lightness to it, which I really like. Plus, while there are multiple POVs, the characters are great. I loved how the characters from Cinder were still very present in Scarlet. Now that Cinder knows more about who she is and what happened in her past, she's more of a fighter, especially for the survival of her planet and herself. After how the first book ended, things are a little rocky with her and Prince Kai, who I just love. And like Cinder, he's got a lot to fight for too, what with Queen Levana being the evil queen that she is. Scarlet was a great new character--snarky, intimidating, and someone who works hard for what she wants and refuses to give up. I liked how different her and Cinder were as main characters. There's also two new swoony boys in Scarlet: Thorne and Wolf. I absolutely loved them both, and I really want to read Cress so I can get me some more Wolf. They were both totally different but I believe they will end up playing critical roles throughout the series. In the end, I'm not sure what else to say about Scarlet. It's the story of a girl going to save her grandma who meets a wolf along the way, with glimpses into what's happening with the characters from Cinder and how they're all going to save Earth and themselves. I liked the book and Marissa Meyer is neither a bad writer nor a bad storyteller, but something about it (maybe this is another book hurt by hype?) just didn't do it for me. Will I read the next two books when they come out? Absolutely. I want to know what happens and I love the characters and I love fairy tales. I just wish that I could love these books like so many other people do. Did I love it? Not really. Would I reread it? There's a possibility.